What does a killer trash monster created by a rough analogue for Banksy have to do with the child Scully and Mulder had together and subsequently gave up for adoption? Well, nothing directly, but that doesn't stop a scattered but emotionally well-meaning episode of The X-Files from working extra hard to create a plausible through line between the two, setting up a situation in which little William (now medium-sized William, probably) is oft referenced in relation to the concept of parents (i.e., creators) taking responsibility for their offspring (i.e., creations). It's a through line that tries very hard to convince the viewer of its validity, comparing children given up for adoption with estranged sons and, finally, progeny that is willed into existence and emerges from stenciled art pieces to literally rip profit-minded individuals limb from limb. 'Home Again' is the logical continuation of the revival's second installment, 'Founder's Mutation,' in that its interest in the narrative of both this one episode and the revival as a whole has a great deal to do with the notion of parentage and, in particular, how Scully and Mulder feel about their son. As far as focal points for the six-episode tenth season go, that's certainly not a bad one, as the idea of having a child existing somewhere out there acts as a well-knotted mooring line to the previous nine seasons, but also offers up a substantial substitute to Mulder's ongoing pursuit of a less specific Truth that's also out there. And after last week's stellar and tonally divergent 'Mulder & Scully Meet the Were-Monster' was focused primarily on Mulder and his decades-long, largely fruitless search for that certainty, 'Home Again' pinpoints Scully's quest as both a mother and daughter as something equally vexing and possibly more emotionally draining. 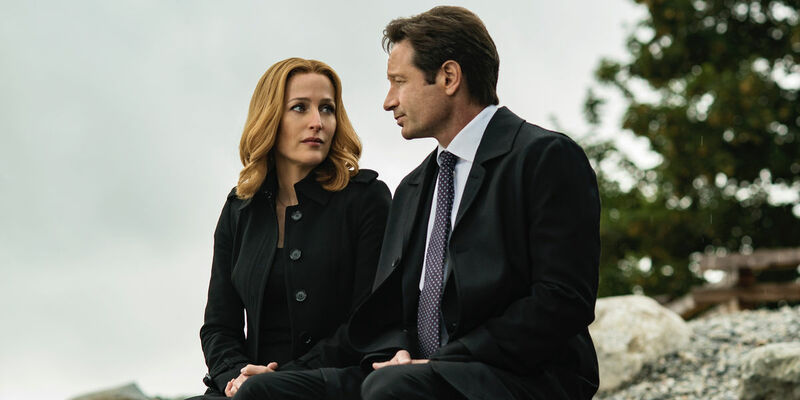 While the connection between the episode's seemingly disparate focal points registers on account of the viewer's pre-existing emotional attachment to Scully and Mulder, there are several points during the hour that seemingly occur to test the strength of that bond. Whether it is a sign of the budgetary limitations of the revival or just a misread on how to properly communicate the tenor of the situation with Scully's mother, her desire to speak with her estranged son Charlie one last time, and her eventual passing, there's just no getting around the awkwardness of Dana having a series of one-sided conversations on her cell phone, all while seeing the name of her son appear on the caller ID. It's easy to see what writer-director Glen Morgan was attempting to accomplish: emotionally isolating Scully as a means of underscoring the extent of her losses both past and present. That is an effective technique in terms of establishing where the character is in terms of her headspace, and it also plays up her connection with Mulder, as his appearance in the hospital ward makes for a solid pull-at-your-heartstrings moment in a series that only occasionally has time for such indulgences. But much of the situation just doesn't play in terms of basic execution. There's nothing dramatically or visually interesting about a watching someone have a telephone conversation that you're only privy to half of. Moreover, Bill and Charlie – Dana's two brothers – don't necessarily carry much in the way of dramatic weight, so Morgan's already at a disadvantage in terms of selling the imminent death of Dana's mother, and the lack of either sibling's physical presence only serves to make what should have been an enormous moment for Scully into something that feels inexplicably inert. That feeling is duplicated when Scully insists on doing work as a distraction from her mother's passing, the revelation she altered her living will, and the direct mention the dying woman made to William. The idea of Mulder and Scully tracking down the creator of the Trash Man makes the most of its hazy connection with Scully's loss, but again, the execution of those ideas comes up short. Just as Morgan pinned a significant portion of the drama surrounding Margaret's death on a series of phone calls, here he inserts a street artist with a tattooed scalp and offers him a lengthy monologue as a means of helping the audience understand the reason for Trash Man and a loose understanding of how he works. This is a technique that's worked well for The X-Files in the past, with great character actors like Brad Dourif, Giovanni Ribisi, or Tom Noonan, but here it comes off less like a character-making moment and more like a way to eat up time. Added to the anticlimax of the last real estate developer being ripped to pieces in a hospital basement, the heavy emphasis on the artist becomes even more questionable. Still, there's a fascinating meta-element to the episode that, despite the problems with execution, makes the hour intriguing, if not entirely worthwhile. The intersection of art and profit and responsibility for one's creation reads like acknowledgement of the revival bubbling to the surface. Even with all the focus on Scully and her loss – which actually culminates in a good bit of dialogue for Anderson in the episode's closing moments – it's difficult not to read into the subtext of 'Home Again' as a response from the series' creators with regard to The X-Files being both the monster they unwittingly created and the child they willingly let go nearly 15 years ago. The X-Files continues next Monday with 'Babylon' @8pm on FOX.